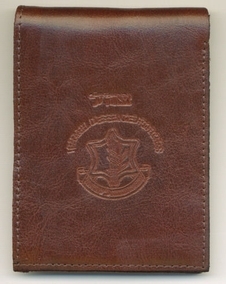 IDF Tzahal Genuine Leather Wallet. The Israel Defense Forces ( Tzva Hahagana LeYisra'el ) Commonly known in Israel by the Hebrew acronym Tzahal , are the military forces of the State of Israel. They consist of the ground forces, air force, and navy. The IDF is headed by its Chief of General Staff, the Ramatkal, subordinate to the Defense Minister of Israel; Lieutenant general (Rav Aluf) Benny Gantz has served as Chief of Staff since 2011.